There is a certain appeal that pavers add to a landscape. The rich color blends and textures of pavers make them warm and elegant. The independent pieces allow for swooping curves, flattering borders and creative designs that no other material will provide. Engineered for performance, pavers are made from an array materials such as concrete, clay and stone. They are durable, strong and long lasting. Being segmental, repairs are easy and seamless. The various sizes create countless paver patterns that produce interesting designs, allowing you to distinguish areas on your paver patio. The ideas are endless! Regardless the size of your paver patio project, large or small, you have the assurance that it will be done right. The size of your budget is not important to us. What is important is that you are looking for a quality project. 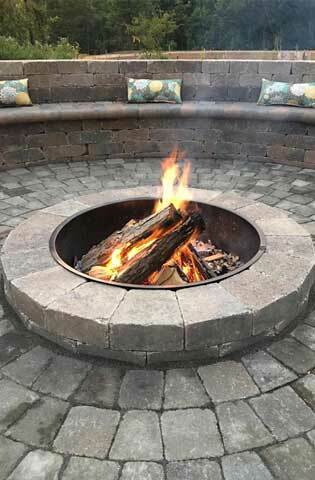 They did an awesome job on the backyard patio and fireplace. I would recommend them to everyone!